SUNRISE, Fla. — The Ottawa Senators snapped their seven-game losing streak, and it came at the expense of the struggling Florida Panthers. Rudolfs Balcers scored a tiebreaking goal in the second period and Senators beat the Panthers 3-2 Sunday, handing Florida its fourth straight loss. "It feels really good for our guys. 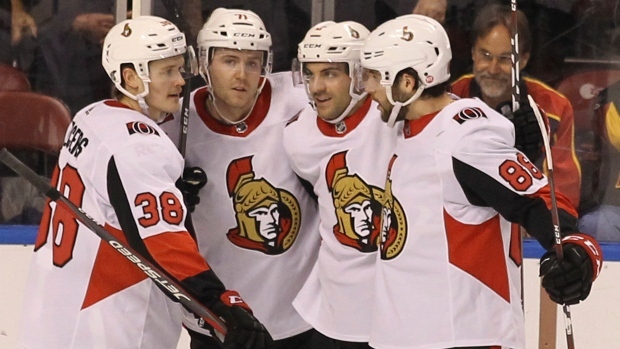 It's nice to see smiling faces," Senators coach Marc Crawford said. "Any games we play against teams that are fighting for their playoff lives are always going to be an energetic game." Balcers gave the Senators a 3-2 lead with a power-play goal with 2:35 left in the second period, redirecting a shot by Dylan DeMelo past Roberto Luongo. "I had a good chance right before that and it hit the post, then I had another chance and it was a nice goal." Balcers said. "It was fun. It was nice to see everyone happy." Crawford got his first win as interim coach after replacing Guy Boucher on Friday. The 58-year-old Crawford has 550 head coaching wins in his NHL career. "(To) the younger Marc Crawford it probably would have meant more. I've got a little better perspective on things now," Crawford said. Troy Brouwer and Aleksander Barkov scored goals for the Panthers, and Luongo made 30 saves. Florida played its fifth game in seven days. "There wasn't a lot of gas in the tank at all," Panthers coach Bob Boughner said. The Panthers' faint playoff hopes are growing dimmer. They are 10 points behind Montreal for the second wild card in the Eastern Conference with 17 games to play. "It's been a tough week, but there's no excuses this time of year," Panthers forward Mike Hoffman said. Trailing 2-1, Gibbons tied the game at 5:06 of the second. Cody Ceci passed from behind the net to Gibbons in the slot, and he beat Luongo on the glove side. "It felt like everyone wanted to win tonight," Nilsson said. "Everyone bought in and even though it wasn't that pretty it was two points and a confidence boost for the team, that's for sure." Smith put the Senators ahead 1-0 when he poked a rebound behind Luongo at 5:10 of the first. Barkov tied the game at 1 at 9:02 of the first. Mark Pysyk took a long shot from above the right circle and Barkov deflected the puck under Nilsson's pads. Brouwer's goal, a wrist shot from the lower right circle, gave the Panthers a 2-1 lead with 4:24 left in the first. NOTES: Barkov has matched his career-high total of 28 goals. ... Gibbons' goal was his first for the Senators since being acquired from Anaheim on Feb. 25th. ... Both teams were playing the second game of back-to-backs. The Senators lost 5-1 at Tampa Bay and the Panthers lost 4-3 in overtime to Carolina on Saturday. ... University of Miami football coach Manny Diaz dropped the puck before the start of the game. Senators: At the New York Islanders on Tuesday. Panthers: At the Pittsburgh Penguins on Tuesday.